I’m grateful for the denominational tradition from which I came. Generally speaking, these were (and are) people who loved Jesus, his Word, and reached out to those far from God. This was the ground from which many of my ministry thoughts and practices still hold sway today in some form or fashion. However, one common trait (though not exclusive or universal) in my denomination which I would challenge is the kind of preaching where the only credible mention of the gospel is at the end of the message in what is known as the “altar call.” I have heard literally thousands of sermons from hundreds of preachers in my life and would characterize many of those as topical messages dealing with how one should live life as a Christian. They were often well-articulated with points (usually three; often alliterated), wonderfully illustrated with a story, and concluded with practical steps deftly-applied. Then, as an addendum, people were told how Jesus wants to save them and, consequently, how they can receive that salvation by saying a prayer, coming down an aisle, filling out a card, etc. #1: It communicates an unbiblical view of spiritual growth. This kind of preaching promotes the false dichotomy that God’s grace in Christ is merely for our justification and not our sanctification. But I Thess. 5:23-24 reminds us we need God to grow in God when it says, “Now may the God of peace himself sanctify you completely, and may your whole spirit and soul and body be kept blameless at the coming of our Lord Jesus Christ. He who calls you is faithful; he will surely do it.” 2 Thess. 2:16-17 confirms this truth saying both Christ and the Father will “through grace, comfort your hearts and establish [his people] in every good work and word.” Our growth in Jesus is just as much a work of grace as our coming to him in the first place. It’s also one more reason why Jesus needs not only to be at the end of the message, but its beginning and middle as well. Only tagging him at the end in some kind of altar call communicates to your listeners, “While I need Jesus to get to heaven, I don’t really need him to live on earth.” Nothing could be more further from the truth. #2: It guides people into reading their Bibles incorrectly. Jesus was very clear. The entire Bible is about him. Period. He said to the religious leaders of his day, “You search the Scriptures because you think that in them you have eternal life; and it is they that bear witness about me.” (Jn. 5:39) A few verses later he reiterated this truth, “For if you believed Moses, you would believe me; for he wrote of me.” (Jn. 5:46) Is there any debate that when it came to the question of what the Bible is primarily about, Jesus steps in and corrects us saying, “You mean who the Bible is about? It’s about me.” Mind you, Jesus was specifically talking about the Old Testament in this context. That’s right, the type of texts that many a preacher wants to make into a character study, moral example, or play of virtues, Jesus says is utterly and comprehensively about him. When we merely tag Jesus and his saving work to the end of our sermon that, for all intents and purposes, is about things they should do (e.g., five steps to a good marriage, the secret to serving others, how to raise your kids) we guide our listeners into wrong ways of reading their Bibles thinking the Scripture is primarily about them when, according to Christ, it’s about the Father’s plan of redemption in him. #3: It may not be a Christian sermon. The law is a gift from God. It is beautiful and good. However, the Scripture teaches us the law has no power to save us. None. Indeed, Rom. 8:3 says, “For God has done what the law, weakened by the flesh, could not do. By sending his own Son in the likeness of sinful flesh and for sin, he condemned sin in the flesh.” When our sermons are full of commands and imperatives for our congregants to do this or be that without showing their connections to the work of the Cross, we run the risk of not just preaching unbiblical messages but unchristians ones as well. How? The sermon can be easily received as the things one must do to curry favor with God or how I earn his love. This is to preach the law not the gospel. Just tagging Jesus at the end of a message essentially absorbed in the law (as wonderful as it is) may find you preaching something less than the gospel. Ask yourself this question: If I took away my altar call could this sermon be preached by another faith or Christian cult and not miss a beat? If so, you’re not preaching a Christian sermon. Tagging Jesus at the end of a message doesn’t automatically a Christan sermon make. 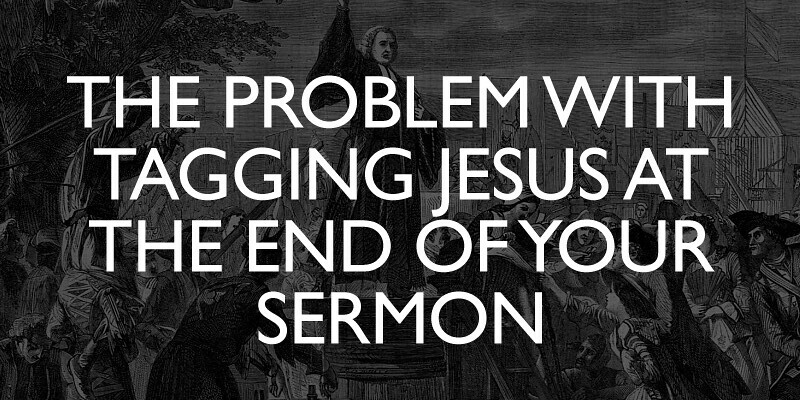 Stop tagging Jesus at the end of your sermons. Don’t let him merely be the footnote of your sermon but the body of it as well. Commit to preach the Bible as Christ preached it, as his apostles preached it, one where the gospel is its length and breadth from start to finish.